Add chicken sausage to the pan, saute for 6-8 minutes. Until sausage is browned. 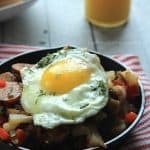 Remove chicken sausage from the pan and put on a plate and place skillet back on burner. Add coconut oil to pan, once melted add diced potatoes. Saute for 15-17 minutes, until potatoes are slightly browned. Season with salt & pepper. Add peppers and onions to the pan, saute another 3-4 minutes. Add in chicken sausage toss and serve.